Colonel Muammar Gaddafi (or Al Qadhdhafi, closer to the Arabic; 7 June 1942 – 20 October 2011) was a Libyan military officer and the de facto leader of Libya from a coup in 1969 until his regime was brought down as part of the Arab Spring popular uprising that began in February 2011. 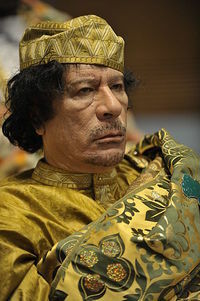 Gaddafi's forces lost control of Libya over several months and he was forced to retreat to his hometown of Sirte, where he was captured on 20 October 2011. He was killed shortly after, but there are conflicting accounts of this. The official statements by the new authorities say he was caught in crossfire on his way to hospital in Misratah and died there, but other accounts say he was "executed" or "lynched" in Sirte. ↑ Arabic: معمر القذافي, pronounced [muˈʕamːaru lqaðˈðaːfiː] or, locally, [muˈʕæmːɑrˤ əlɡædˈdæːfi]. There have been many transcriptions in English: Muʿammar Al Qadhdhāfī is the most exact one, Muammar Gaddafi is the most frequent one. Other romanization attempts are Moammar (Al) Gadhafi, Muammar (Al) Qaddafi, Qadhafi, Qaddhafi, Qathafi, Gathafi, Gheddafi, Kadhafi, Khaddafi, Khadafy, Gadafy, etc. This page was last modified 19:47, 13 January 2012.